Today’s post is going to be about a new favorite topic… wedding cake! I have found this to be one of my favorites parts of planning for my wedding! For anyone with a sweet tooth, how can it not be? Luckily, Chris shares my sweet tooth so we had a lot of fun throwing around ideas and plotting and planning. 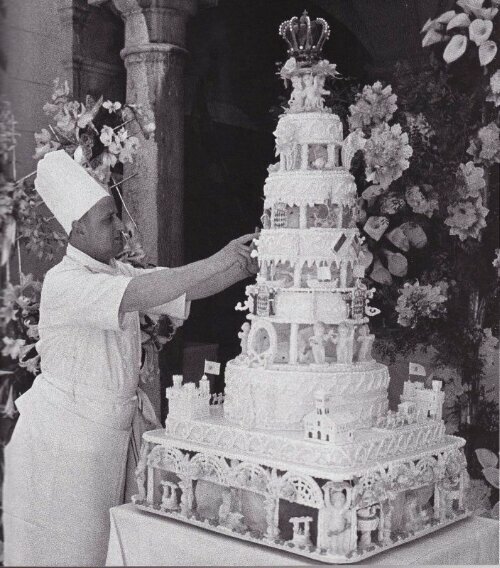 A few months ago, I came across an article about Queen Victoria’s wedding cake in Entertainment Weekly. Her wedding is credited for being the first to have a cake. And it’s pretty ornate! I love the delicate, feminine look of this cake. 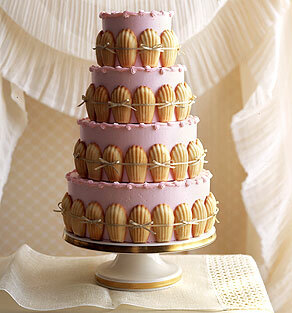 The French Madeline cookies, the pink icing, the decor on the upper edge of each layer. 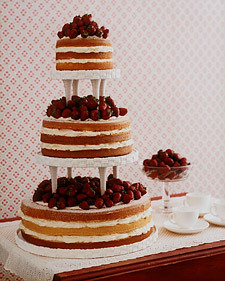 A scaled down version of this would be perfect for a bridal or baby shower! This cake is ornate! No novices could pull this off, but it still has a simple, understated look that keeps it from seeming too intricate. This was one of my favorites. 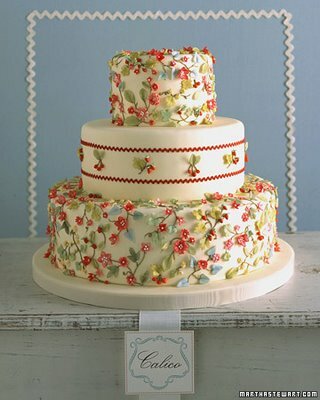 I love the rustic simplicity of this cake, and how it still manages to look elegant and refined. This was a design we considered for our wedding cake! We eventually wound up going with something else but I plan to make a smaller version of this! This served as an inspiration for the Groom’s Cake. For those who don’t know of this tradition, the Groom’s cake is another cake served at the wedding that the bride has made based on the tastes, hobbies, and interests of the Groom. Sometimes it’s a surprise, but it doesn’t have to be. This is a tradition that originated in the South. I kept the cake topper for ours a secret from Chris, but told him about the flavors I had planned. He loves chocolate and peanut butter, so he was a little hesitant when I didn’t want to consider chocolate for our wedding cake. 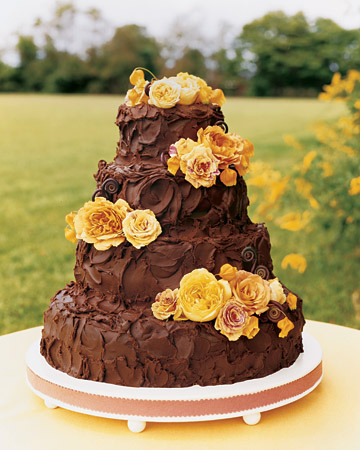 Our groom’s cake was chocolate, with peanut butter ganache filling and rippled chocolate icing, like in the above picture. The bakers gilded fruit that my mom and aunt found with gold food powder, and used nuts, greenery, and red berries to top both the groom’s cake and the wedding cake. 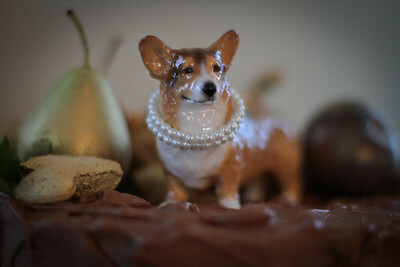 Perched in the middle of the groom’s cake was a small figurine of Chris’ beloved corgi, Snuffy. My aunt, Jill, is a master chef and baker. 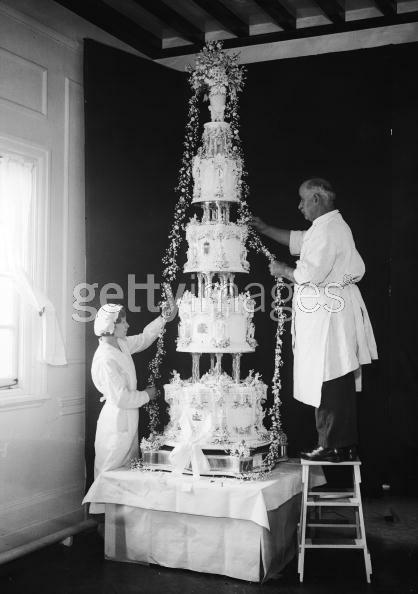 She was originally going to bake both the wedding cake and groom’s cake, but we ran into issues with the logistics. 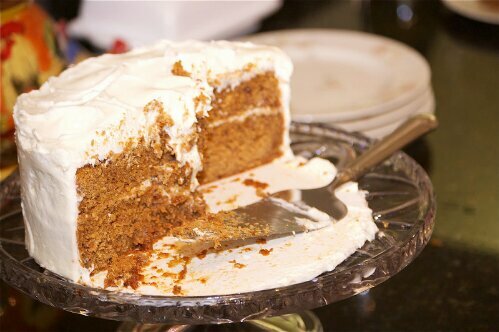 She still made a killer pumpkin spice cake for my bridesmaids’ luncheon! Now that I’ve indulged myself in a little sweet talk today, time to go clean… the mound of clothes in the laundry hamper isn’t going to wash itself! More related articles below!